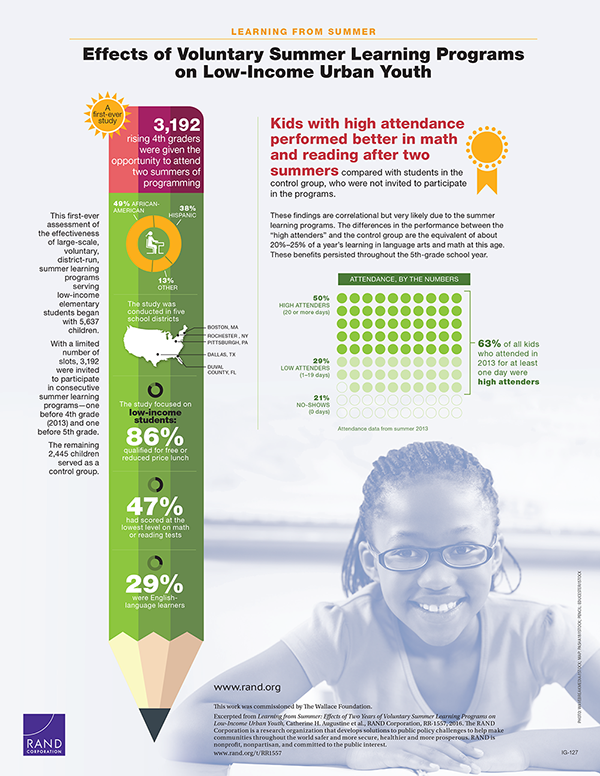 Kids with high attendance performed better in math and reading after two summers compared with students in the control group, who were not invited to participate in the programs. These findings are correlational but very likely due to the summer learning programs. The differences in the performance between the "high attenders" and the control group are the equivalent of about 20%-25% of a year's learning in language arts and math at this age. 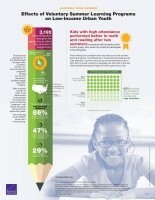 These benefits persisted throughout the 5th-grade school year. This first-ever assessment of the effectiveness of large-scale, voluntary, district-run, summer learning programs serving low-income elementary students began with 5,637 children. With a limited number of slots, 3,192 were invited to participate in consecutive summer learning programs -- one before 4th grade (2013) and one before 5th grade. The remaining 2,445 children served as a control group. This work was commissioned by The Wallace Foundation. This report is part of the RAND Corporation infographic series. RAND infographics are design-focused, visual representations of data and information based on a published, peer-reviewed product or a body of published work. Augustine, Catherine H., Jennifer Sloan McCombs, John F. Pane, Heather L. Schwartz, Jonathan Schweig, Andrew McEachin, and Kyle Siler-Evans, Learning from Summer: Effects of Voluntary Summer Learning Programs on Low-Income Urban Youth. Santa Monica, CA: RAND Corporation, 2016. https://www.rand.org/pubs/infographics/IG127.html.